Harry Bates’s 1940 short story Farewell to the Master and 20th Century Fox’s 1951 film The Day the Earth Stood Still are two stories about the sudden arrival of the alien Klaatu and his metal companion and the events that ensue. Inspiration from the former was clearly used to create the latter, but is this truly a case of adapting the short story to the big screen? I argue that The Day the Earth Stood Still is only an adaptation of Farewell to the Master in the loosest terms, and that it would be more accurate to describe the former as being “inspired by” the latter than as an adaptation. There are a number of similarities between Farewell to the Master and The Day the Earth Stood Still. Both feature an alien craft suddenly arriving in Washington, DC. Both feature a humanoid alien named Klaatu coming with a message of peace and his eight foot tall robotic companion (Gnut in the short story, Gort in the film). Both feature a delay for the military and others to get into position before Klaatu emerges from his ship and Klaatu being shot almost immediately. In both stories, Klaatu is temporarily revived by his mechanical companion at the end of the story. Beyond these superficial similarities, however, the plots take entirely different paths. In Farewell to the Master, Klaatu is summarily executed by an extremist believing him to be the Devil, leaving Gnut operating with his own agency for the majority of the story. Gnut takes several steps, none of which involve communicating with human authorities, and it remains unclear as to why Gnut and Klaatu came to Earth in the first place. In The Day the Earth Stood Still, Klaatu survives the initial gunshot (from a soldier) and spends a brief time trying to organize a meeting of the Chiefs of State of all countries (including those states which are not members of the United Nations) before turning his sights on a meeting of notable scientists occurring at his ship while attempting to evade the authorities until the climax. In Farewell to the Master, the protagonist is Gnut. The story is driven (unknown to the reader until the very end) by Gnut’s desire to revive Klaatu. The events in the story are caused each time Gnut progresses in his experiment, the facts of which are revealed to Cliff when Gnut and Klaatu believe the experiment to have reached its final failure. The Day the Earth Stood Still, on the other hand, is primarily about Klaatu and his desire to make a speech to the authorities of Earth – first political authorities, and then intellectual ones. In both versions, the other story’s protagonist lacks agency; Klaatu spends most of Farewell to the Master as a corpse and Gort is almost always either inert or acting on Klaatu’s behalf. There are other differences between the versions of these characters, but they are mostly superficial with little effect on the story (though the introduction of quasi-Christian themes to Klaatu’s dialogue is noteworthy). The audience surrogates may be the biggest difference between the two stories, at least outwardly. Farewell to the Master is focused around the viewpoint of a photo-journalist named Cliff, who is attempting to learn what Gnut is doing when nobody is looking. This results in a character who is able to bypass security, but passively observes the action without becoming directly involved whenever possible. In The Day the Earth Stood Still, there are two audience surrogate characters: Bobby and Helen. When Klaatu escapes the government at the end of the first act, we meet Bobby (Billy Gray), a young boy with an inquiring mind but enough youthful innocence not to recognize from “Mr. Carpenter’s” responses that he is Klaatu. 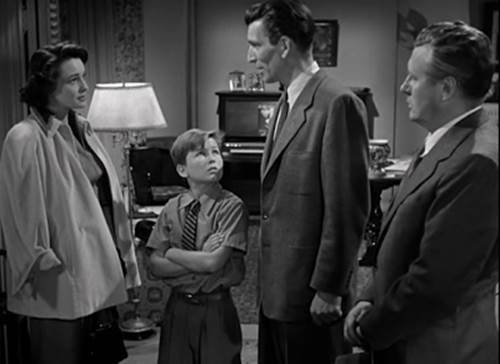 Bobby’s mother Helen (Patricia Neal) is also introduced in this scene, but prior to the final act, Helen is largely removed from the story. Bobby’s questions and view of the world allow us to learn more of Klaatu’s outlook and origins while allowing Klaatu to advance his own agenda without scrutiny. Once Bobby learns that Mr. Carpenter is, in fact, Klaatu, the boy’s role in the story is complete, and Helen largely takes over the role of audience surrogate. In addition to being a recipient of exposition from Klaatu, Helen is also able to take on additional roles such as negotiating with the antagonist, passing on messages, and otherwise acting in a way that a child such as Bobby would find difficult. Helen is more suited to participating in the action-packed final act, without taking driving force of the action from Klaatu. In both Farewell to the Master and The Day the Earth Stood Still, the government acts as a sort of conglomerate antagonist, working to deny the alien visitors the ability to act without their permission. This has the same sort of overarching, non-personal feel that a jungle might have as antagonist of a safari film. However, while Farewell to the Master lacks a personal antagonist, the final act of The Day the Earth Stood Still introduces a true antagonist: Tom (Hugh Marlowe). Tom is introduced to the story through Helen (as her boyfriend), and is moved to action by the same event she is (the revelation by Billy that Mr. Carpenter is truly Klaatu). 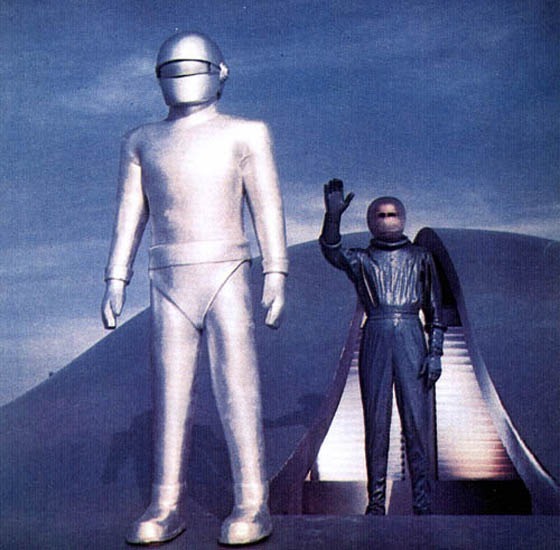 While Helen acts as a supporting character that helps Klaatu achieve his goals, Tom immediately acts for his own gain, setting off a string of events that drastically increase the tension (especially compared to Farewell to the Master’s final act) that ultimately leads to Klaatu’s death and Helen’s encounter with Gort. The Day the Earth Stood Still is a war parable. While it drapes itself in the trappings of early Cold War patriotism (demonstrations of military power and an overwhelmingly positive portrayal of Christianity), its message is that of “peace or else” and carries threat of force reminiscent of Mutually Assured Destruction policies. It is no mistake that tensions with the Soviet Union are referenced both explicitly (representatives of nations allied with NATO and the Soviet Union refuse to meet on one another’s ground) and implicitly (when Mrs. Barley suggests that “[Klaatu] came from right here on Earth. And you know where I mean”). Farewell to the Master, by contrast, makes no mention of World War Two, which had been ongoing for over a year by the time the story was published. Instead, it is set in the future; at least one Mars mission has occurred at start of story. Rather than the follies of war, the short story warns of judging based on appearances without investigating. There may be a racial element that is as relevant today as it was in 1940 (Gnut is assumed to be slave or servant to the more humanoid Klaatu until the final line in the story) or it may be a warning of things to come, such as other alien resources or a change in the organic-technologic relationship similar to that seen more explicitly in later films such as The Matrix or Terminator. Neither of these options are present in The Day the Earth Stood Still, in which Gort is part of a race of glorified attack dogs, demonstrably following Klaatu’s orders. The race of robotic peace-keepers is referred to as being powerful and having authority in certain matters, but never as being intelligent enough to make decisions; Klaatu even indicates that, without his guidance, Gort may mindlessly destroy all life on the planet. This is a far cry from the independent civilization Klaatu references. While The Day the Earth Stood Still is unmistakably a product of its time in style, message, and delivery, Farewell to the Master is more timeless. While a modern reader can easily recognize the changes in common writing practice that have occurred over the past eighty years, the story and message are ones that could be believed equally to have been written in the earliest days of journalism or today. The Day the Earth Stood Still’s plea for world peace remains with us, but the fear of nuclear annihilation is mostly behind us. The apparently Christian alien (“the Almighty Spirit” who holds sole proprietorship over life and death is at most a short step away from Christianity’s Holy Spirit) is certainly a less believable image in 2017 than that of the extremist proclaiming the alien visitor to be the devil and shooting him.